- JoAnn Bartoletti, Executive Director, National Association of Secondary School Principals (NASSP). On September 13, 2018 Project Tomorrow released the first of a series of briefing papers titled “The Educational Equity Imperative: Leveraging Technology to Empower Learning for All” at a Congressional Briefing held in Washington, DC and online in a special live stream of the event. Dr. Julie A. Evans, Project Tomorrow CEO, discussed selected national findings from the Speak Up 2017-18 brief and moderated a panel discussion with students, teachers and administrators who shared their first-hand perspectives on the role of technology in supporting a variety of learning experiences. 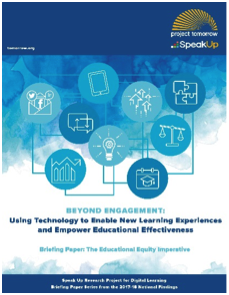 To share the Speak Up 2017-18 national findings, Project Tomorrow plans to create a series of briefing papers and infographics to address key topics in the effective use of technology to enable new learning experiences and empower educational effectiveness. School principals value the use of technology within learning as an agent for both empowering learning and addressing the educational inequities inherent in the education enterprise today. Programs that provide students with an assigned laptop, tablet or Chromebook are not only leveling the playing field for students’ technology access at school, but they are also enhancing the learning experience for those students, as reported by both principals and students. Teachers’ use of digital content, tools and resources in the classroom helps students develop the types of workplace and college ready skills they all need to be successful in the future and thus, the effective use of those tools is enabling more equitable learning experiences at school also. Over 100 people attended the Congressional Briefing including congressional staff members, student and staff representatives from some of our Speak up schools, and staff from many of our sponsors, champion outreach partners and non-profit partners. Students and Educators from Fairfax County Public Schools (VA), Frederick County Schools (VA), Prince William County Schools (VA), and Southern Columbia Area School District shared their insights regarding their daily digital learning experiences. Watch the recording of the briefing and panel here.